AR. Rahman popularly known as 'Isai Puyal', 'Mozart of Madras' is one of the marvelous music directors in the country. He has literally put Indian Cinema on the globe by winning Oscars in 2009, indeed it was was a very proud moment for every Indian. He is the favorite music director for the 90's kids, inspired many technicians with his work. He changed the music trend and created his own. A few days back people on social media trolled Isai Puyal for imposing Islam on women in his family. Through Twitter medium Rahman clarified that it is completely their choice what to wear and what not to, will never impose such things on them. He tweeted thus "The precious ladies of my family Khatija, Raheema, and Sairaa with NitaAmbaniji #freedomtochoose". 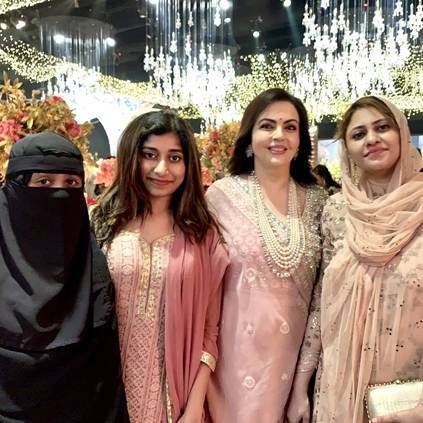 If you remember during the event of 10 years of Slumdog Millionaire, you can see Khatija Rahman wearing a Burkha, while Raheema and Sairaa has been seen without it. Indirectly Rahman gives a retort to the trolls on him by saying Burkha is the choice of the women and he is not imposing anything. Also, Khatija Rahman comes up with a post on her Facebook page, clarifying on this issue: "The recent conversation of myself on stage with my dad has been doing the rounds although I didn’t expect such an overwhelming response. However, there were certain comments which said that this attire is being forced by my dad and that he has double standards. I would like to say that the attire I wear or the choices I make in my life does not have anything to do with my parents. The veil has been my personal choice with complete acceptance and honour. I’m a sane mature adult who knows to make my choices in life. Any human being has a choice to wear or do what he/she wants and that’s what I’ve been doing. Hence, kindly don’t make your own judgements without understanding the exact situation. #freedomofchoice".